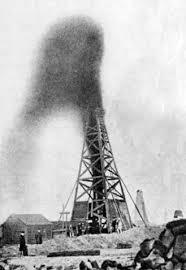 Home › Under the Same Blue Sky › “We struck oil!” he gushed. Preparing for a workshop on dialogue writing (2/28 in Knoxville), I’ve taken a wild detour into Tom Swifties, the fabulously inventive construction used by Dickens and perfected in the Tom Swift book series (1910 and onward) in which dialogue tags get subsumed into outrageous puns. There are hundreds, and hundreds more you can create with a few friends and some wine. Not that they’re recommended for high-style literary fiction, but they sure are fun. For more about the workshop (not Swifties), click here. “I’ll have a martini,” Tom said dryly. “That’s the last time I’ll stick my arm in a lion’s mouth,” the lion-tamer said off-handedly. “They amputated at both ankles,” said Tom defeatedly. “There’s room for one more,” he admitted. “I gave him an haircut,” Tom said barbarously. “That is a whole lot of hay,” Tom said balefully. “Now what did I want at the grocery store?” Tom asked listlessly. “There must have been a power failure,” Tom said delightedly. “I need a pencil sharpener,” Tom said bluntly. “We have cause for a mutiny,” Tom said bountifully. “Use your own toothbrush,” Tom bristled. “I find you guilty,” the judge said with conviction. “But I didn’t go to Egypt,” said Tom, deep in denial. “April was terrible and next month will be worse,” said Tom in dismay.